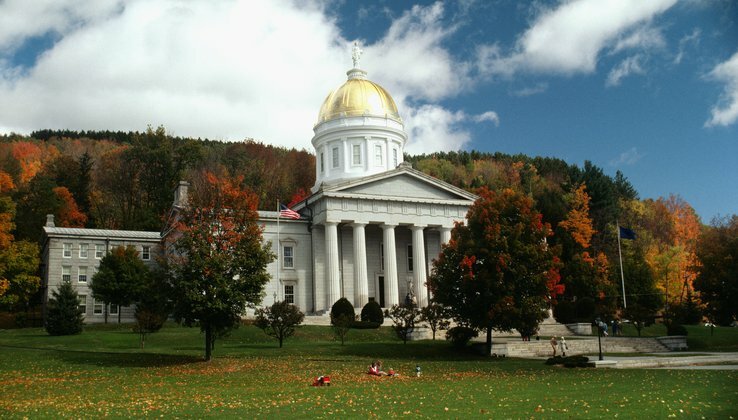 In July 2018, the Vermont Joint Fiscal Office hired Resources for the Future (RFF) to compile a report on decarbonization policies for the state. The report documents our research on methods to reduce Vermont’s greenhouse gas (GHG) emissions. Specifically, we examine both carbon pricing policies (carbon taxes and cap-and-trade programs) and nonpricing policies (incentives for electric vehicles, weatherization programs, etc.). We detail the level of GHG emissions reductions from these policies and compare this with the climate goals of the State of Vermont. Emissions in Vermont have been increasing since 2011, and the state is not expected to meet its GHG emissions targets with current policies. For example, Vermont statute mandates that state GHG emissions be 58 percent below 2005 levels by 2028, or 50 percent below 1990 levels. Additionally, Governor Scott has set a target, through the US Climate Alliance (USCA), of reducing emissions to levels that are 26–28 percent below 2005 emissions by 2025. Under current policies, however, Vermont emissions are only projected to be 14 percent below 2005 levels in 2028, shy of both above mentioned targets. In addition, our analysis suggests that Vermont is unlikely to meet its emissions targets with a carbon-pricing-only strategy, unless the carbon price is substantially higher than the prices modeled ($19–$77 per metric ton of carbon dioxide equivalent in 2025). Vermont has a high share of emissions from transportation and heating fuel use, and both of these sectors are difficult to decarbonize. Our analysis also suggests that by combining moderate carbon pricing and a set of nonpricing policies recommended by the Governor’s Climate Action Commission, emissions could be reduced enough to meet the state’s USCA target, though not enough to meet the state’s statutory target. Under this combined approach, emissions are projected to be 32–38 percent below 2005 levels in 2025, compared with the target of 26–28 percent. The economic impacts of carbon pricing in Vermont, in terms of state GDP, employment, or overall economic welfare, are expected to be very small. Ignoring the environmental benefits of the policy, we project that the total economic costs of the various carbon pricing policies we studied to be between $7.1 and $61.2 million in 2025 ($20–$100 per person, on average). When we consider the climate and health benefits, each carbon pricing policy is projected to produce benefits that would exceed its economic costs. A carbon pricing policy would generate significant revenue for the state: $74.7–$433.8 million in annual revenue in 2025, depending on the carbon price amount and number of sectors covered. In choosing how to use this revenue, policymakers will face trade-offs between environmental outcomes, overall economic costs, and the impacts on different types of households. One such use is per household rebates (or lump-sum rebates, sometimes referred to as “carbon dividends”). Per household rebates take the net revenue collected from a carbon pricing policy and return it through equal payments to all Vermont households. According to RFF’s modeling analysis, per-household rebates more than offset the costs of increased energy prices for the average low-income household. Carbon pricing revenue can also be used to reduce taxes on wage income. This would lower the overall cost to Vermont’s economy relative to other options considered, but these cuts would not fully offset higher energy prices for low-income households. Devoting revenue to finance nonpricing policies would reduce GHG emissions further, but would also impose higher costs on Vermonters. This is because revenue that could be used to partially or fully offset the economic impacts on households of carbon pricing would instead be redirected toward funding more policies to reduce GHG emissions. Given Vermont’s current emissions profile, with emissions concentrated in transportation and heating fuels, decarbonizing the economy to meet the state’s goals will require new, ambitious policy. Our quantitative evaluation suggests that a carbon pricing–only decarbonization strategy in Vermont is unlikely to produce the level of GHG emissions reductions required to meet the state’s climate targets (unless, as mentioned above, the carbon price is set substantially higher than levels considered in this study). Our analysis also demonstrates, however, that the combination of a moderate carbon price with a comprehensive set of nonpricing policies (for example, from providing electric vehicle and energy efficiency incentives, to increasing the stringency of the statewide Renewable Energy Standard) could allow the state to meet some, but not all, of its emissions reduction targets. The economic effects of carbon pricing in Vermont are expected to be small; and under all policies we modeled, the public health and climate benefits outweigh total costs. How the revenue from carbon pricing is recycled has important implications for how the costs are distributed throughout the economy—including how low-income and rural households fare compared to upper income and urban households.